Canti Pinot Grigio Wine has an intense straw yellow with greenish reflections. Canti Pinot Grigio Wine is dry, soft and well balanced with apple-citrus flavors. 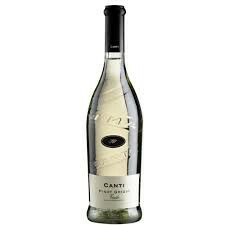 Canti Pinot Grigio Wine has an intense straw yellow with greenish reflections. It is perfectly Ideal as an aperitif, or with fish, pasta with delicate sauces.